Featuring fun rhymes, bright illustrations, and four big mystery flaps, “Guess Who: Baby Animals” is one of the newest additions to the popular format! An exciting pop-up on the last page adds to the charm of this adorable book. Who is hiding near her mother? Who is waiting to hatch? 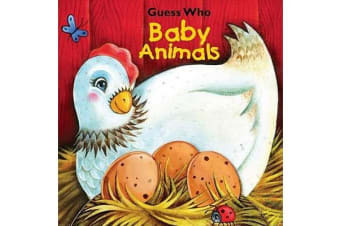 Children will love guessing which of their favorite baby animals (koala, kangaroo, chicken, emperor penguin) are hiding in this adorable book. As they read the clever rhymes, kids will discover the four different animal friends hiding beneath big flaps. A surprise pop-up at the end of the book adds to the charm of this delightful book.